Town Meetin’ is held the first Tuesday of March, every year. It is, in fact, the Town and School District Annual Meeting in Townshend rolled into one all encompassing term. Some townships hold their two meetings on different days. Some townships hold their meetings in the evening and they stretch over many days. Townshend’s starts at 9:00 AM on Town Meetin’ Day and has always managed to finish on that one day though there have been some days when when it was questionable. Oh, there was that one time when the snow situation was so bad a half dozen folks dragged themselves up to the Town Hall and sat there long enough to elect a Moderator and recess the meeting for a week. Here, in Townshend, candidates for office are not required to pre-file their intent to run and, about a month before the big day, the big discussions in Townshend revolve around who might run for office. Nominations for a host of public positions are taken from the floor and the votes for those individuals are cast by paper ballot if the race is a contested one, which many times it is not. It is at this meeting that requested budgets for the Town and the School District are presented to the voters for approval (or not). Proposed budgets may be amended from the floor. That being said, one could also say that this is really where that property tax bill comes from. Prior to 2009, Town and School Meetings were warned and conducted as a single meeting. Vermont education law changed and required that each entity have a separate meeting even if they were held “together”. 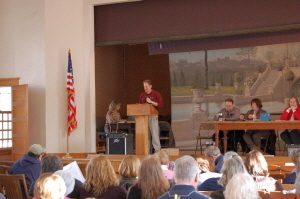 Videos come from Brattleboro Community Television starting with the 2012 Town Meeting. Giving credit where credit is due. It is said by many that Town Meeting is the purest form of Democracy and, yes that is probably true. It could also be said that it represents the way Democracy should be. Neighbors come together and, at times, vehemently disagree with each other but sit down and have lunch together without issue. Folks speak their mind and are more than willing to allow their friends and neighbors to disagree without that impacting their friendship. Those who have been attending Town Meetings in small VT towns for any length of time will also tell you that it is the time when million dollar items tend to pass with hardly a whimper but that $100 expenditure will require two hours of debate, at the very least. Warnings and / or minutes posted here may be signed or unsigned but they are the final versions. Please note that, starting with Town Meeting 2016, BCTV also publishes a basic index of the meeting. This index is based on the warned articles. If you are looking for a particular discussion point / article in the meeting, scroll down below the video where you will find their index. The index will give you the approximate time stamp for the item.